Clare Crespo's books have been fun inspiration for us candy freaks here at CANDYMONIUM for a while. 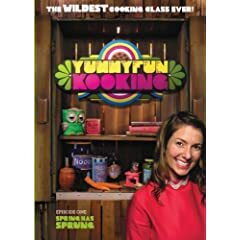 Now the "crazy cupcake lady" has created a new kids' cooking show called YUMMYFUN! She's written many a recipe using beloved candy. Here's her fantastic recipe for CHOCOLATE MICE! Be Very Quiet And You May Hear The Scurrying Of Tiny Chocolate Mice As They Build Their Nest. Let's Hope A Chocolate Cat Doesn't Find Them! Try Making A Whole Mouse Family With Babies. These Would Be Fun To Have At An Event Where You Also Serve Cheese. In a double boiler (or microwave on low power), melt the semisweet chocolate, stirring thoroughly. Cover and refrigerate until cold and firm, about 20 minutes. In a large mixing bowl, combine the chilled chocolate with the sour cream. Add the chocolate wafer cookie crumbs and mix well. By teaspoons, roll the dough into a slight oval shape. Form one end into a slight point for the nose. Place the cocoa and powdered sugar into separate small bowls. For dark mice, roll the ovals in cocoa powder. For white mice, roll the ovals in powdered sugar. On each mouse, press in candies for the eyes and nose and almond slices for the ears. Attach a licorice whip for a tail. Refrigerate for at least 2 hours until firm. Clare Crespo, The Secret Life of Food. Photographs by Eric Staudenmaier. A Melcher Media Book, Hyperion Books for Children, New York, 2002.